WeetHet - Satellite - How does Internet by Satellite work? On this page I briefly try to explain how Internet by Satellite works. 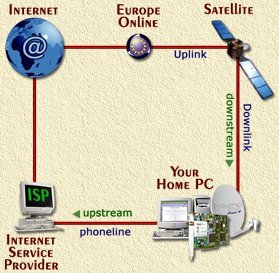 Note: if YOU are an Internet by Satellite provider and feel you are using a different technique, then please let me know. 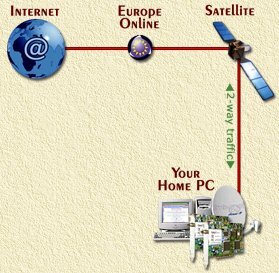 EON (=Europe Online Networks) offers a basic solution for using the Satellite (Astra) for accessing webpages. This solution does not care which or what ISP (Internet Service Provider) you use. Any ISP will do. Other providers will use similar techniques. Limitations: only HTTP is supported. So, IRC (chatting), Napster (MP3 downloading), POP3/SMTP (e-mail), etc will not work. In the above image you will see how it works (basically). So what happens when I request an URL (Universal Resource Location, for example http://www.WeetHet.nl) ? 1. Your webbrowser will use the networking capabilities of your Operating System (for example Windows) to send a request to your ISP. This typically is done by using a modem and a phoneline (it doesn't matter if this is PSTN, ISDN or ADSL). 2. Your ISP will send your URL request to the EON prioxy using the existing Internet infrastructure. 3. The public proxy at EON will try to fetch the information you want (the webpage) from the Internet. 4. Once received the EON proxy will beam the information packages to the Astra Satellite. 5. The only part of the satellite is to relay this information to your receiver dish. 6. Your receiver dish, hooked up to the DVB-card, will relay all received information to your DVB-card. 7. The DVB-card (and the software that comes with it) decides if the received information is for you. If it is, it will relay this information (again using the networking capabilities of your Operating System) to your webbrowser. If the entered URL makes sense, the page will appear. If the URL does not exist or an other error occured, the error message generated by the EON proxy will appear on your computer monitor. BySky, a dutch acces provider, uses the EON infrastructure too. There is just one small difference. The performance is definitly better. Not just that ! You will be able to not only get HTTP information, but also POP3/SMTP (e-mail), IRC (chatting), etc. So what's the difference then? 1. 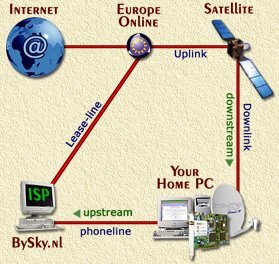 Your webbrowser will use the networking capabilities of your Operating System (for example Windows) to send a request to the Bysky ISP connection. This typically is done by using a modem and a phoneline (it doesn't matter if this is PSTN, ISDN or ADSL). 2. BySky will send your URL request to the EON prioxy using the dedicated (and faster) lease-line. 3. The private proxy at EON will try to fetch the information you want (the webpage) from the Internet. This is the most expensive solution of 'm all. Using a special dish (oval shaped instead of round) you will beam requests directly TO the satellite. Current packages like that are very expensive and you will have to pay for each bit you receive/transmit. The hardware package does not only include a DVB-receiver-card, but also a DVB-transmitter-card, a special dish and a special LNB for transmitting data to the satellite. Advantages here are speed en no HTTP limitation. Also: you don't need a phone connection for the upstream. 1. Your webbrowser will use the networking capabilities of your Operating System (for example Windows) to send a request to the EON proxy. This is done by an (mostly 16 Kbps) upstream to the satellite. 2. The proxy at EON will try to fetch the information you want (the webpage) from the Internet. 3. Once received the EON proxy will beam the information packages to the Astra Satellite. 4. The satellite will relay this information to your receiver dish. 5. Your receiver dish, hooked up to the DVB-card, will relay all received information to your DVB-card. 6. The DVB-card (and the software that comes with it) decides if the received information is for you. If it is, it will relay this information (again using the networking capabilities of your Operating System) to your webbrowser. One of the providers (in the Netherlands) offering this service is IXS.